Home » Other Categories » If you invested USD 50.000 on 2005, are you happy or sad? Posted by on | Comments Off on If you invested USD 50.000 on 2005, are you happy or sad? If you remember Nokia suffered of something like this around the year 2000. Their stocks were worth USD 56 being the leader on mobile phones at that time. Exactly 10 years later in 2010 they lowered to USD 13 per share, and its is still dropping being in November 2012 at: USD 2,5. From my point of view, Nokia´s main problem was the inability to see that the market was changing, they kept on using their Symbian OS while the market was moving to other systems offering a better experience. Too late for my taste they announce a partnership with Microsoft, lets see how much success they have working as separate companies before Microsoft buy´s them out or dumps them. We all knew that Nokia needed to do something, and they waited and waited, until it was too late. I´ve even wrote a post in my Spanish blog about this the day before Nokia announced the partnership with Microsoft, so If I knew it, they should have known at least a year in advance. Now something similar is happening with other companies that some years ago were top brands like Research In Motion (RIM) better known as Blackberry. 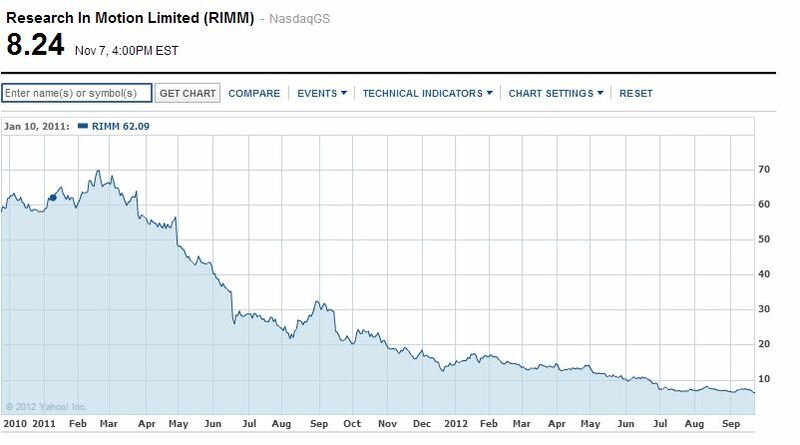 In 2008 RIM´s stocks where at USD 140, and to the day of this post they are USD 8. 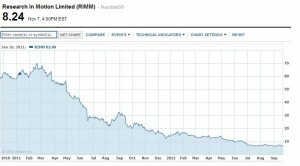 Not for nothing the US Government has cancelled the exclusivity contract with RIM as they also started buying Apple and Android devices. RIM is sinking as Nokia times and a lot of private companies are also dropping their Blackberries and choosing other more flexible smartphones which offer a more complete experience. Their market share dropped from 3% in 2Q 2011 to 1.9% in 2Q 2012. Nowadays mobile phones are not used only for calling or sending SMS. Now you have a complete computer at your pocket and you can do a lot with it. RIM´s future is uncertain, they are asking their less and less platform developers to please stick with their platform until they release their new OS (v10) for their devices in2013. But the market wont wait for them and with Apple & Google stores passing the 700.000+ Apps they don’t have much of an alternative rather than being bought by a big player or die trying. So, if you invested USD 50.000 on a top Tech company in 2005, how much money did you lose or win? Lets check out the following chart I created based on Yahoo Finance numbers. What do you think will happen with companies that are struggling to survive and with the other´s that are very comfortable at the top? Share your comments below.